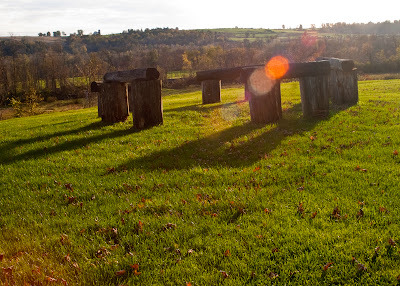 A “woodhenge” near Beardslee Castle, the location of my wedding. This past weekend, my husband and I celebrated our second anniversary. We knew each other for a few years before our wedding, so it actually feels like we’ve been married for a lot longer – and I mean that in the most positive way. We’re each other’s best friend and get along so well! Our relationship has only strengthened with time and I feel so lucky to have found a wonderful mate. One of his many good qualities is his acceptance and support of my religion. Weretoad is agnostic but doesn’t find fault with my beliefs. Because Druidism is so important to me, he consented to having a Druidic marriage ceremony. We had it at the atmospheric and beautiful Beardslee Castle in Little Falls, NY. Our bound hands at the ceremony. As you may imagine, a Druidic, Pagan marriage ritual has many differences from a Christian one. One could argue that the values celebrated are the same, but that really depends on the couple and their desires. 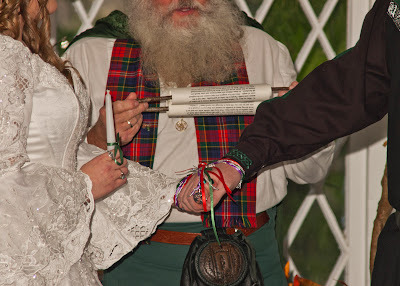 For example, when binding the hands (a tradition called handfasting in many Neo-Pagan weddings for the curious non-Pagans reading this), my Druidic Priest, Skip, gave the option of tying the knot tightly or loosely. My husband and I are monogamous so we went with the tight option, but a polyamorous or more open couple may wish for a loose handfasting. A majority of Druids embrace a diverse range of marriage options. We chose the colors of the cords based on what they magically correspond to in our minds and path. We also included the Neo-Pagan tradition of jumping the broom. It is symbolic for fertility, which probably went over most guests’ heads. Thus, you can fit a few smaller magical workings into a larger rite! Another difference was the inclusion of the Three Kindreds. Skip worked closely with us to determine how overtly Pagan we wanted our ceremony. Because of the diversity of our friends and family, and my husband’s desire for a short ceremony, we decided to keep it on the mild side. We honored the Kindreds individually with offerings but kept it short and sweet. 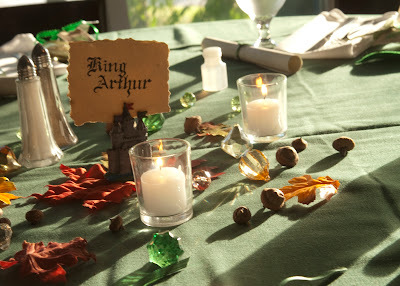 One aspect of our ceremony that may have stood out to our guests was the use of divination. Skip had us draw oghams to indicate what we were bringing into the marriage. Weretoad drew White Poplar which he interpreted as buoyancy above difficulties. Quite honestly, he’s always been better able to stay calm than myself. I can be a little too passionate at times! I drew witch-hazel for magic. Skip drew the final ogham – muin – which was significant because of the grove we attend and the fact that it can represent intoxication and binding together. They were very good omens! 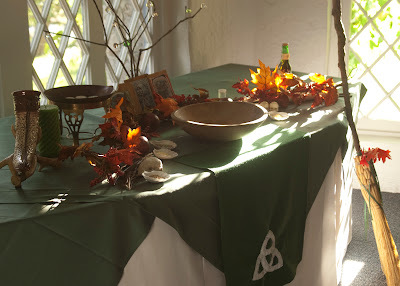 Our wedding altar which included an altar cloth I made, a broom, a ceramic drinking horn, a unity candle, representations of the three hallows, and offering bowls. Despite these differences, there were some similarities to Christian rites which were recognizable to many family and friends. We decided to use a unity candle, for example. While not tied to any one religious tradition, they are often incorporated into Catholic ceremonies. My sister gave us a beautiful green candle for the trick. To further symbolize our joining together, we drank from a ceramic drinking horn. Many Catholics do something similar with wine and the host. We also utilized vows – again, something not specific to any one tradition. This, along with our handfasting, was a central part of our rite. As many know, Druids value oaths and take them seriously. It was a very moving experience to recite these. My husband actually cried. One of the decorated tables. Other details of our wedding included a loose Medieval/Renaissance theme, Irish music, video game references (like our Final Fantasy 7 cake toppers), costumes, and an ancestral altar. Everything we chose for our ceremony was selected with care because we wanted it to reflect ourselves, our heritage, and our values. I didn’t let myself get too caught up with Celtic Reconstructionism when considering my ritual – I wanted it to honor the Kindreds and be important to us. I think we were very successful. Our wedding was wonderful and will remain one of the happiest nights of my life. A special thanks to Joe Pietruch and Cathy Razim – our very talented friends and photographers! You two are so wonderful together! Happy Anniversary!! I was so happy to have you be a part of it! Glad this post cleared up some of your curiosities. And thank you so much. 🙂 I look forward to saying the same thing to you and Joe in the future! 😀 Still so giddy about it! You’ve given me some good things to think about. Best of luck! Pretty much everyone at our wedding knew I was Pagan but we didn’t want to rub it in their faces too much. Still, their knowing made things easier! How open are you with your family? Even if you are “in the broom closet,” I can imagine quite a bit of Druidic touches by having a very Irish/Scottish/Celtic wedding. 🙂 Keep me updated with the progress and feel free to share your ideas! I love weddings. I especially love the altar cloth you made, and Skip looks like a wonderful character! I’m sorry you regret your ceremony… You could always renew your vows! I actually sacrificed that altar cloth at the next ritual I attended. I wanted to thank the Kindreds for such a wonderful wedding. I told you, I had something in my eye! I’m so glad you jumped the broom! That’s still a big deal here in the South and every once in a while couples jump the broom as they leave the church. I’ve read that it’s a huge tradition among some African Americans. I think it’s really cool. I don’t know exactly how it entered modern Pagan rites.. Probably because we love witchy symbols. I’ll have to brush up on my wedding lore to re-familiarize myself with the tradition.